Baaki Sab First Class Hai Full Song Lyrics with English Translation and Real Meaning Explanation from upcoming Bollywood movie Kalank, the groovy track has been composed by Pritam while Amitabh Bhattacharya penned the lyrics, Arijit Singh & Neeti Mohan sang this song, the music is available under the label of Zee Music Company. The audio mp3 version of First Class song by Arijit Singh is free to download and stream from Gaana, Wynk, JioSaavn and other online music portals. 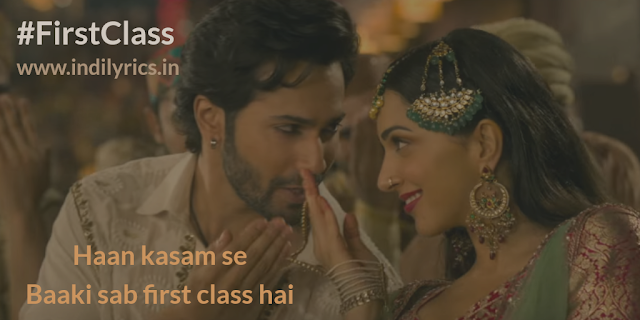 The music video of First Class from Kalank stars Varun Dhawan and Kiara Advani. Karna kya hai chaandi sona..
What will I do with wealth? Hum toh dil ke dhande ke byapari hai….